One of my favorite books/movies is "The Big Year." There are slight differences between the book and the movie, but basically the plot follows three men on their individual quests to see the most birds in one year. I'm not an avid birder by any means, but I do love the central theme of the movie which is: What are you passionate about and what will you do to follow that passion? When I first watched the movie and later read the book I found myself wondering if there was anything I would want to spend a whole year pursuing. It's taken me over 5 years to answer that question. And in some ways I've only just started to glimpse what I'm truly passionate about. But I do know two things that I love. I love to see new places, and to do new things. 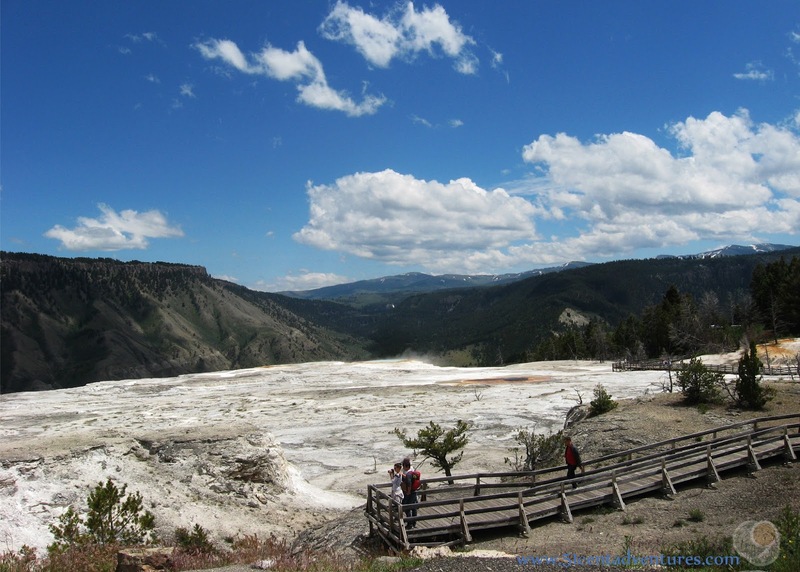 I'm not in a situation where I could travel and see new places for a whole year, but I have figured out how to live in Yellowstone with my family for the summer, so I think that counts. Many times during the past few weeks I've thought of a scene from the movie version of the Big Year. One of the characters, played by Jack Black, has accomplished his dream of flying to the distant Alaskan Island of Attu. He spends two weeks there seeing many birds he's never seen before. It's basically his version of paradise. I've tried to find the movie clip on Youtube, but the specific scene isn't available. So go find the full movie and watch it. Pay close attention when you get to the scene where Jack Black is riding a bicycle while the song, "When I ruled the world" by Coldplay is playing. The look on his face shows exactly how I've felt since we arrived in Yellowstone. 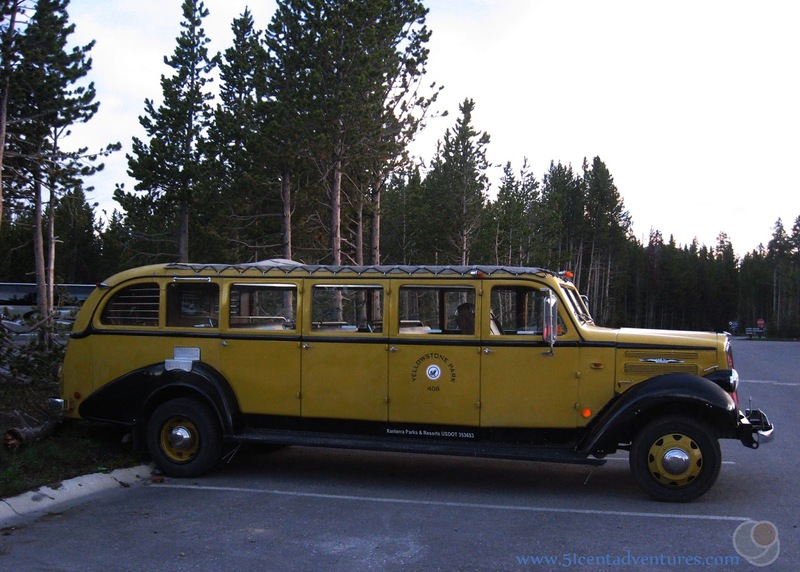 We visited Calcite Springs on the northeast section of the Grand Loop Road. This is an easy trail to a beautiful overlook of the Yellowstone River. While we were there a nice lady offered to take a family picture, and miracle of miracles, all the kids jumped into the picture and looked at the camera. So here is our first family picture from Yellowstone. On another day we went to Tower Waterfall. This waterfall is also on the northeastern side of the Grand Loop Road. The waterfall is about 200 feet from the road and the trail is easy to get to it. I've only seen this waterfall in pictures, and I'm sorry to say that the waterfall is underwhelming in real life. The picture I took isn't even worth uploading. Most of the pictures you see advertising Tower Fall are from the base of the falls -which you can't climb down to. So instead you look at it from directly in front of the falls. It's not that great. 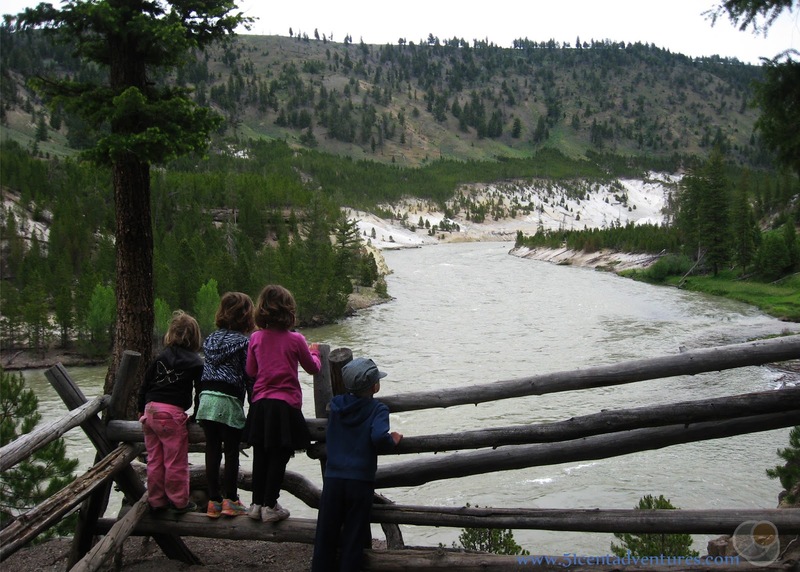 What is great is the view of the Yellowstone River. 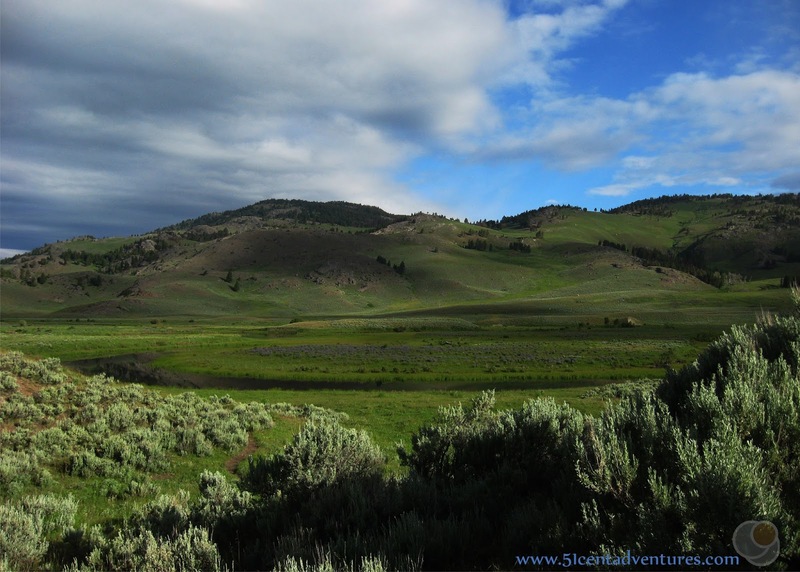 This river is the longest undammed river in the United States. Right now it's full from all the melting snow. I love watching the water flow though the canyon. We hiked down a rough trail to the bank of the river. My son threw rocks in the river while the twins constructed a giant sculpture of drift wood. They said it was a place where ducks could come rest. 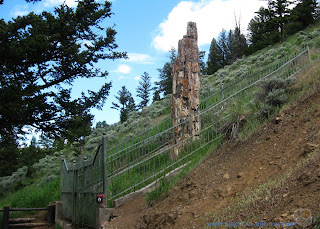 We only stopped at the Petrified Tree because it was on the way to Mammoth. 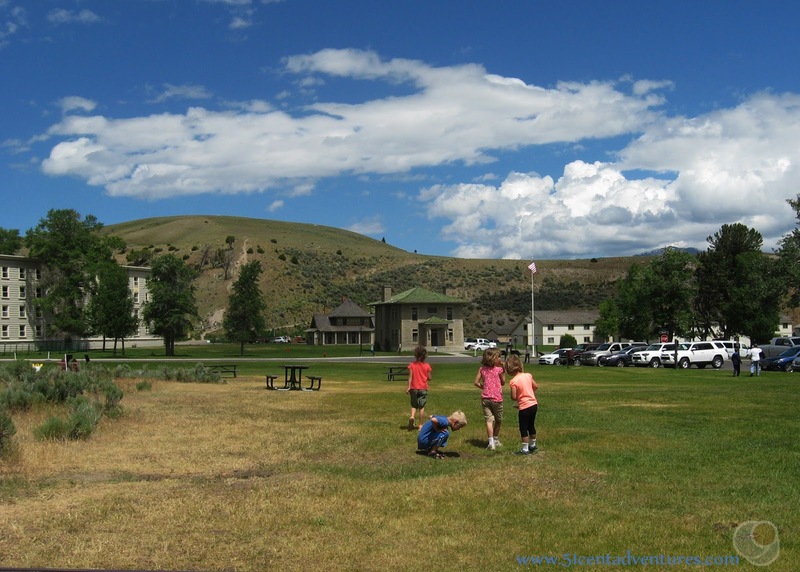 We had a picnic lunch on some tables in a large field across from the Visitor Center at Mammoth Hot Springs. 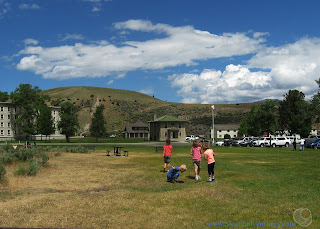 The kids had a lot of fun chasing ground squirrels around. 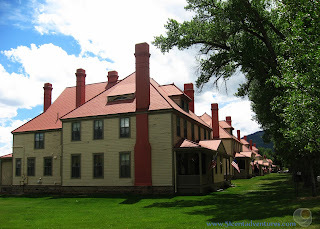 Then we went for a little walk around the historic buildings in Mammoth. 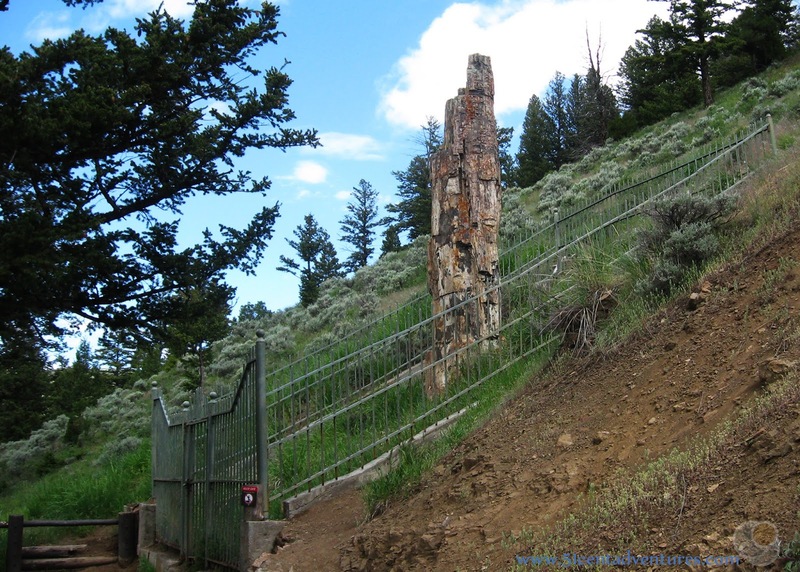 These were built over 100 years ago as officer quarters when the Army was in charge of Yellowstone and this was a Fort. 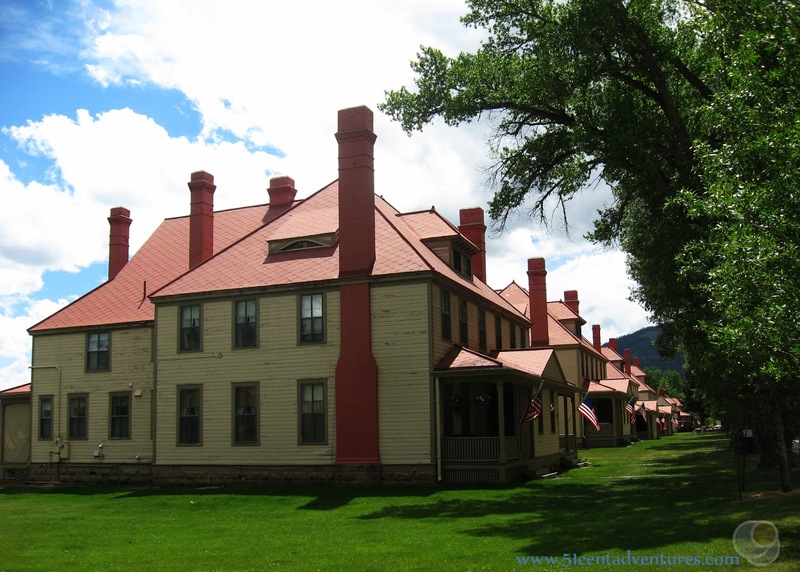 They are still in use as homes for employees of the National Park Service. We wanted to see the hot springs, but we felt it was a little too hot to go for a walk up and down all the steps on the terraces of the board walk. (And the area was getting really crowded with tourists.) So instead we drove on the Upper Terrace Drive. 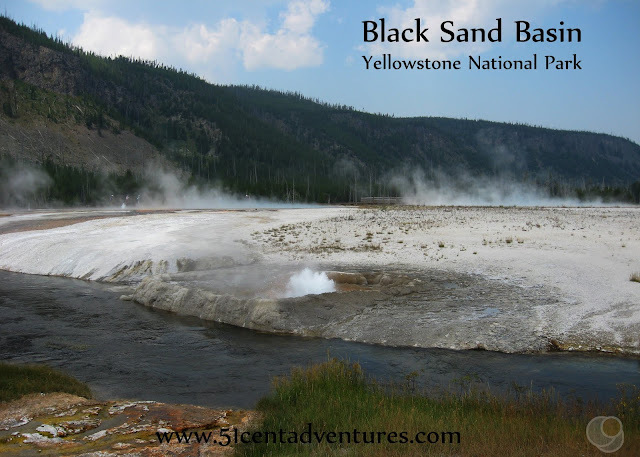 This is a nice little drive that lets you see the hot springs without much effort. The funny thing is that later that day, as we drove back home we watched a rain storm roll in. 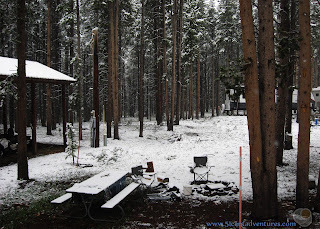 By that evening it was snowing at our RV spot. And unlike the other two times it's snowed while we were here - this snow stuck around overnight. This is what we woke up to on June 13th. When I packed for this summer I knew that summer snow storms were a possibility. I'd packed all the kids' winter coats and gloves in a box and wrote "Open in Case of Winter" on the top. My husband dug that box out of the back of our closet, gave the kids their coats, and took them out for a drive. One of the places they went was the North Rim Canyon Drive. And they saw this black bear hanging out in a tree. This was less than a 1/4 mile from the Campground and Hotel at Canyon Village. All those signs that instruct you to keep your food locked up are not kidding around. The weather stayed cool and rainy for most of the week. One evening it was nice enough that we decided to take a hike down to the edge of the Lower Falls. This was the first hike we attempted when we first moved here. The kids had taken turns crying during most of that hike and the lower half had been closed so we couldn't even get to the water. This time was much better. 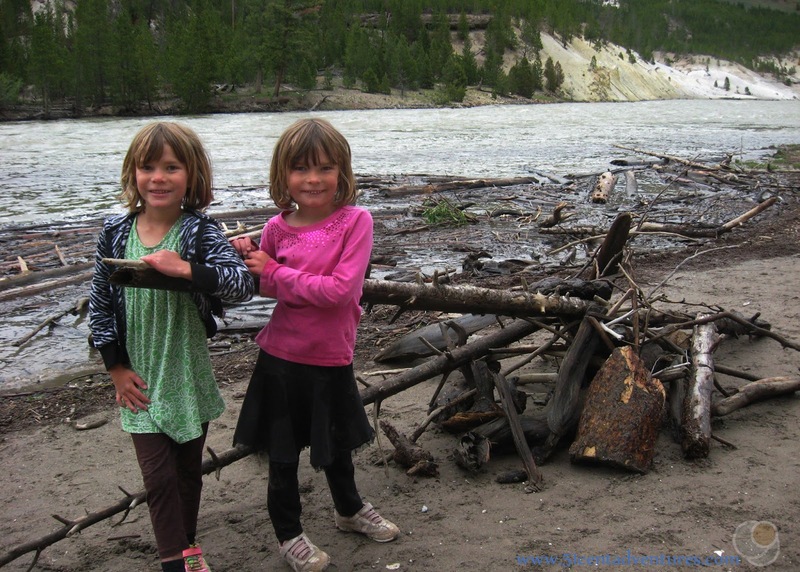 My husband has been conditioning our kids with long hikes through the back country (their record is 4 miles), and so they were much better hikers. They did great going down and up. 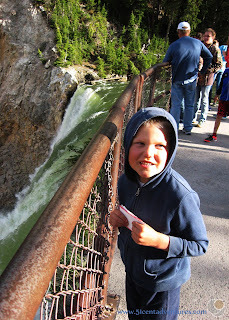 My son and I loved watching the water pour over the edge. My husband's family had a family reunion during Father's Day weekend. We've missed out on this reunion all the years that we lived in Texas and Alabama, so even through it was about an 8 hour drive to Utah, my husband wanted to make sure he made it this year. I had to work during 2 of the days so I couldn't go. That meant my husband would be in charge of travelling with all four kids by himself. I kind of saw this as pay back for all the times I had to travel with the kids while my husband was stuck with various Army assignments. My family left on Friday morning. I worked all day and then came home and read a book for FIVE glorious uninterrupted hours. It was pure heaven. I worked again on Saturday. My indulgent activity that evening was going to the gift shops and leisurely window shopping. It's the simple things. I didn't have work on Sunday, but instead of sleeping in I got up at 5:30 so I could try to get a spot on one of the tour buses that goes around the park. Xanterra employees can ride the buses for free as long as there is space available. There were two no shows so I got lucky and was able to go on the Wake Up to Wildlife tour inside one of the Historic Yellow Buses. This particular bus was named "Hollywood" because it had been used as a prop in the movie "Big Trouble in Little China." The tour was pretty amazing. It went from Canyon Village through the Larmar Valley, out the North East Entrance, stopped in Silver Gate City, and then turned around and came back. Along the way we got out to see animals through an animal spotting scope that our guide set up. Our guide was named Travis and he gave great information about the park and the wildlife in it. 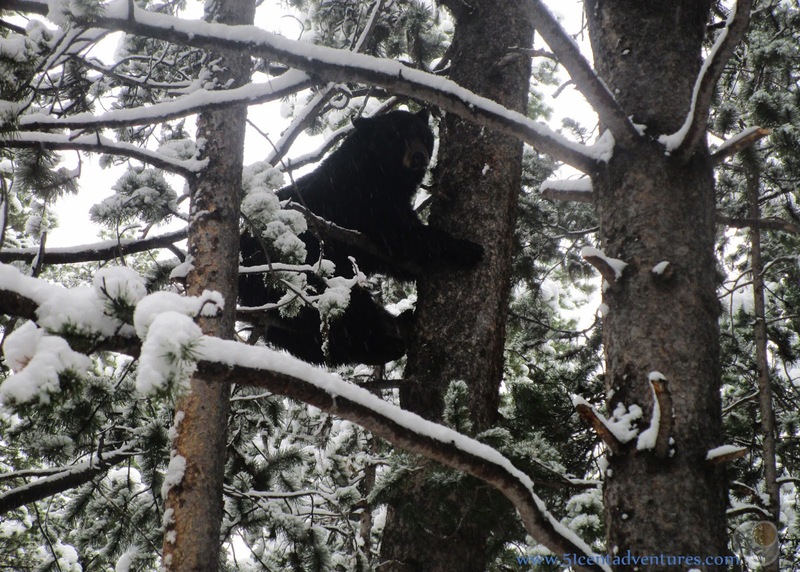 We were able to see a Grizzly Bear through the scope at one stop. Another stop was at an observation place across from a wolf den. This is what it looked like normally. The scope allowed us to see the den that was located about halfway up that mountain. When I looked through the scope I could see a wolf poking its head up through the grass. At other stops we saw a nest with two Great Grey Owls inside. Later we stopped to see an Ospry nest with two birds in there as well. One was feeding the other little pieces of fish. At another point we saw a Red Tailed Hawk fly right by the bus. Maybe I am on my way to being a birder. In addition to the birds we also saw big horn sheep, a coyote, a fox, pronghorn, and lots and lots of bison. 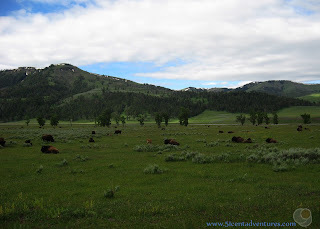 I'd never been to the Lamar Valley before and I didn't realize how many bison, and baby bison lived there. The tour lasted 5 hours and was very enjoyable. This specific tour usually costs $90 for adults and $45 dollars for children. 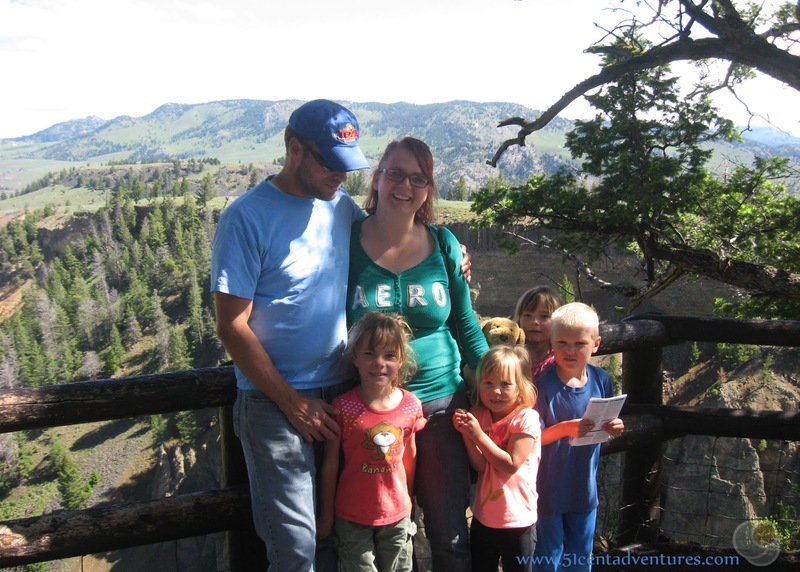 There is no way I could afford to do this tour - let alone take my family on it- so I was very glad that I had this chance to go on the tour for free while my family was out of town. I wasn't quite sure what I would do to keep myself entertained on Monday, so I was interested when I heard that the Canyon Corrals were offering free horse back rides for Xanterra Staff on Monday. 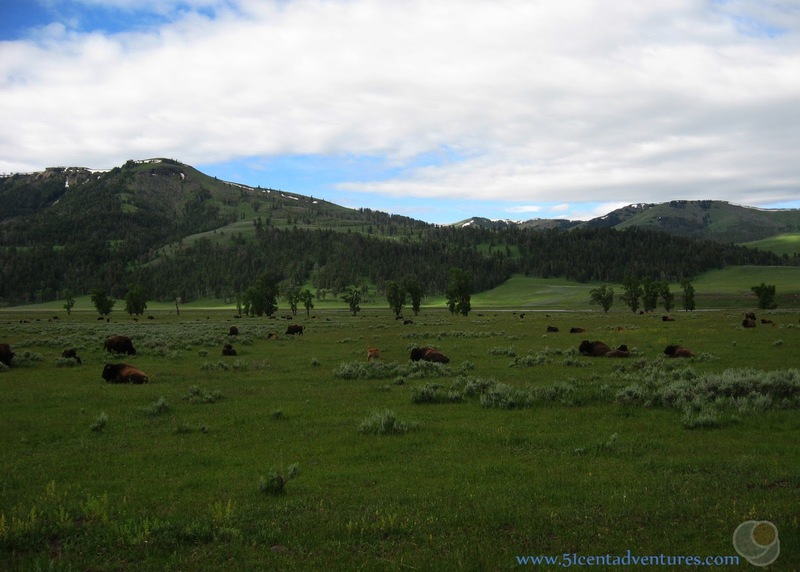 The Corrals opened to the public on Wednesday June 21, and so this would be their practice day for the horses and wranglers. The last time I was on a horse was 17 years ago when I was 15 - and I HATED it! Absolutely hated it. I'd been scared of my horse, I didn't feel in control of the situation at all, and I'd ended up with a big headache. I vowed never to get on a horse again. So at first I was like, "nope, I'm not going on that ride even if it is free." But then I started to think about it. I've grown up a lot in the last 17 years, and I've done plenty of scary things. I've gone to college, I've given birth to four children, I've moved countless times, and gone on many long cross country road trips - with young children. After all that, maybe getting on a horse again wouldn't be so scary. Besides, my husband was always talking about how he wanted to go horse back riding as a family when the kids get older. I figured it might be a good idea to face my fears now while it was free. So I signed up for the ride. When I arrived at the corrals I heard one of the Wranglers say, "let's go ride a horse, through bear country, on top of an active volcano!" I was like, "well when you put it that way, how can I say no." I ended up being part of the very first group for the day/season. I was given a HUGE black horse. I think he was the biggest horse in the corral. His name was Travis which I thought was funny since that was the name of the tour guide from the day before. When I'd ridden a horse when I was 15 I'd also had to saddle the horse. That was part of what made the experience so stressful for me because I'd been afraid of doing it wrong. I was very happy when I found out that that horses were already saddled. I was also happy that I didn't have to wear a helmet. On my last ride my helmet had been too tight and that had contributed to the headache. A lady wrangler helped me mount Travis and gave me a quick lesson on how to hold the reins. She took my picture with my phone camera and then put the camera into a lock box. For safety reasons we couldn't bring cameras, water bottles, binoculars, or other things like that with us. I was fine with that since I knew I'd be busy with my horse. Despite his size Travis was very gentle. But he was also quite a handful. He's part draft horse so he liked going along at a plodding pace. I had to constantly give him little kicks to get him to speed up so we could close the gap between us and the horse in front of us. Travis also liked to try to eat grass all along the way. So I got really good at pulling his head back up and kicking him to keep him going. At one point he decided he didn't want his spot in line anymore so he turned around and walked back along the trail for about 10 feet. The wranglers quickly instructed me on how to get him turned around and back in line. One of the wranglers told me that Travis would make me into a cowgirl by the end of the ride. Even though I had probably the most problematic horse I really enjoyed the ride. There were 3 or 4 wranglers riding alongside the line of horses. They gave great suggestions about how to handle the horses - especially Travis. I never felt like the situation was out of control. This was definitely a much better experience for me than the last time I'd been on a horse. 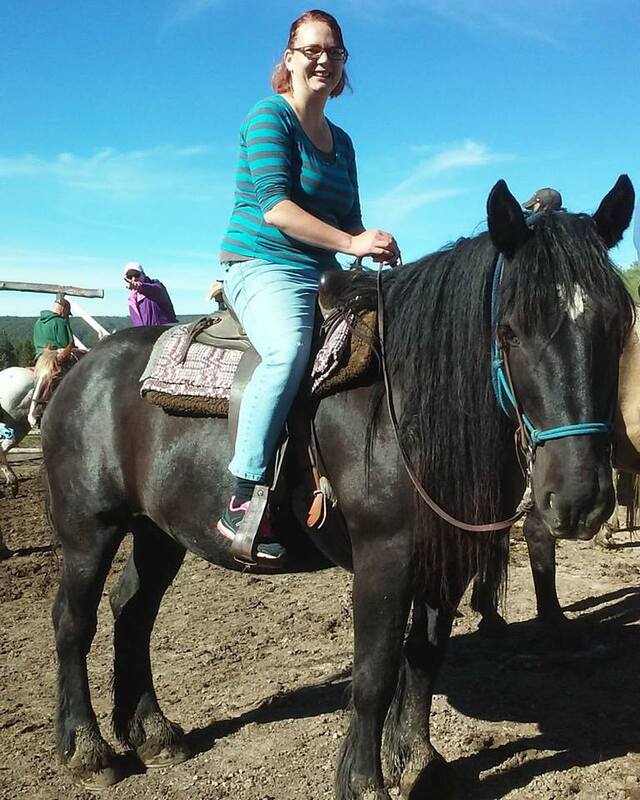 Horse back rides cost $49 for a one hour ride and $72 for a two hour ride. Again this is something I couldn't have afforded to do on my own and certainly not with my family - who are actually all too young to ride on these horsed anyway since you have to be over 8 to ride. I'm really glad that it worked out that I could do this and conquer one of my fears. And in case you were wondering, yes, my husband and children did survive their weekend away from me. The family reunion was a great success and they all had a great time. They made it back to the RV around 10:00 pm on Monday night. My husband is basically super man because in addition to driving back from Utah he'd also stopped and looked at 3 rental houses in Pocatello. 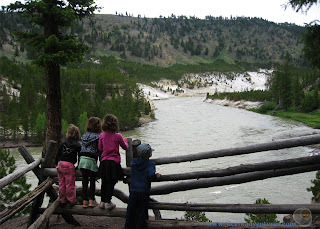 (We are enjoying our time here in Yellowstone, but we also have to be preparing for the next phase of our lives.) Their last stop was the Walmart in Rexburg where the kids helped my husband grocery shop for two weeks worth of food. Yes, he's Superman. My husband took it easy on Tuesday, but by Wednesday he was ready to get back to exploring. He took the kids on a hike in the morning, and then we all went on a hike after I was done with work in the evening. 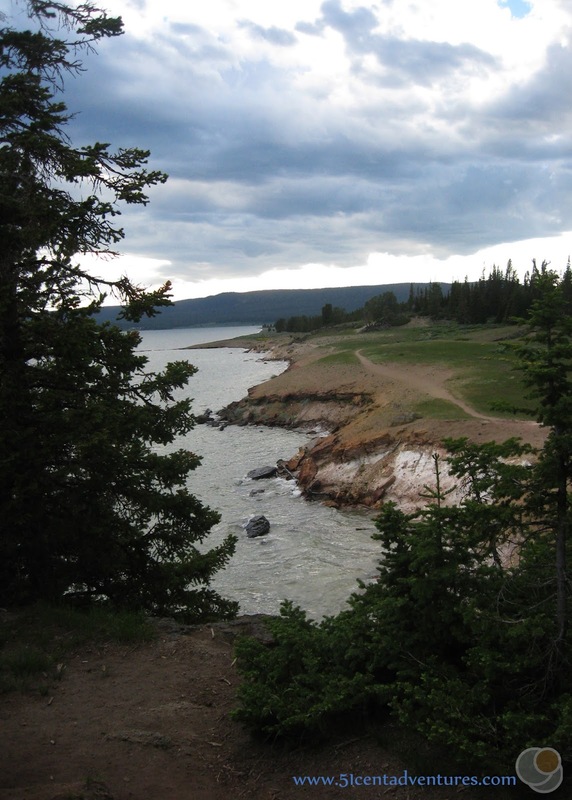 We went to Storm Point on the North Shore of Yellowstone Lake. The trail head is a little east of the Fishing Bridge area. All of Yellowstone is pretty, but this was beautiful. So that's us lately. We are all very happy to be here. I'm feel so blessed that we have this opportunity to live in such a wonderful and unique place. This is definitely a summer to remember.